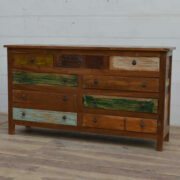 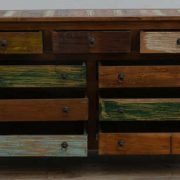 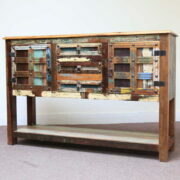 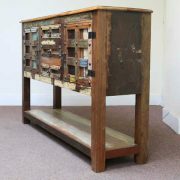 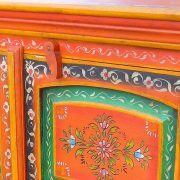 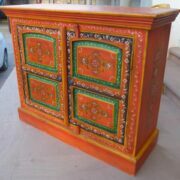 Colourful sideboard with three cupboards and three drawers..
A colourful and distinctive sideboard made from reclaimed wood. 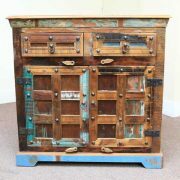 With three drawers and three single cupboards there’s room for your things: tableware, kitchenware, cutlery or other items. 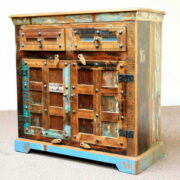 The recycled tin fronts on doors and drawers, and distressed paintwork, mainly in blues give it a striking and unique look.